Spinel is an attractive gemstone that comes in many colours with red being the most sought after. Kuh-I-Lal (Tajikistan) has produced pinkish red spinel of excellent quality for over a millennium, and they were historically regarded as being rubies (‘Balas rubies’). Other old mining areas include Sri Lanka and Burma. More recent deposits are found in Madagascar, Tanzania and Vietnam. Especially rare is Cobalt spinel, which is characterised by a vivid and saturated blue colour. Spinel is not frequently treated. 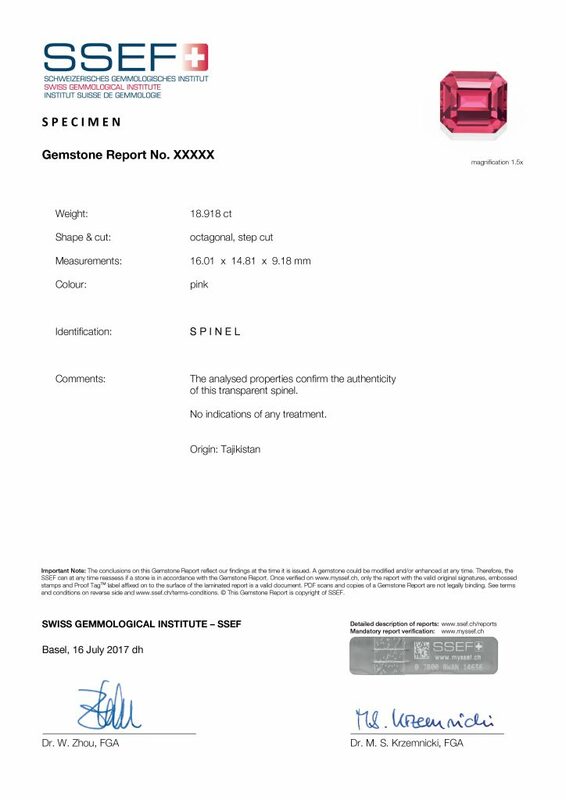 The SSEF report number is the number given to the spinel when it is submitted for testing, and is a unique number. If an item is resubmitted later for a ‚recheck‘ after re-cutting or for a report update then the spinel obtains a new report number. The photo of a spinel depicts the gem at the time of testing. The photo on an SSEF report is for representational purposes and does not necessarily represent actual colour, clarity or size. For size comparison purposes, approx. magnification used is provided under the photo on the report. Weight of a spinel in carats, measured and stated with 3 digits. In the case of mounted jewellery, total weight corresponds to total weight of jewellery item(s) and is stated in grams. Estimated weight is an estimation -for example- for stones mounted in jewellery. The actual weight of a stone may be different to the estimated weight and can only be determined unmounted. Colour description on an SSEF report for a spinel describes both the colour hue (e.g. red), potentially a modifier (e.g. pinkish red), and the saturation of colour in an analysed gemstone (e.g. light blue). A synthetic spinel would be clearly identified and labeled on a report in the identification section.